Snarky Geeks Episode 153 - ...The Unforeseen Trilogy! 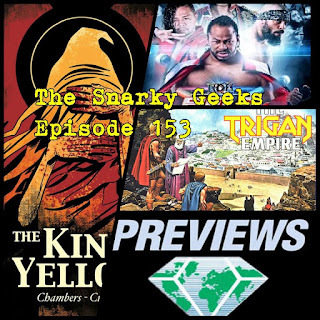 This duo of Snarks bring the Wrassling talk, talking more on ROH Field of Honor, NJPW, NXT Takeover, PWS, SummerSlam, Then they go over their picks for the November Diamond Preview, DK III, Slash and Burn, Max Landis, The state of Vertigo, Image and Marvel, then they review a couple of comics, The King in Yellow from Selfmadehero, and Trigan Empire, and much more , and the Sorry-List! .... you really have to listen to the whole show!